Refer to the procedure in this topic to use Ops Manager with the Cisco Nexus 1000v Switch. First, configure Ops Manager through Step 4 in Configuring BOSH Director on vSphere. Then configure your network according to the following steps. From your Pivotal Cloud Foundry (PCF) Ops Manager Installation Dashboard, click the BOSH Director tile. Click the network name to configure the network settings. This is default if you have not changed the name. Find the folder name and port group name for the switch, as you configured them in vCenter. For the example vSphere environment pictured below, a user might want to use the switch configured on the beer-apple port group, which is in the drinks-dc folder. 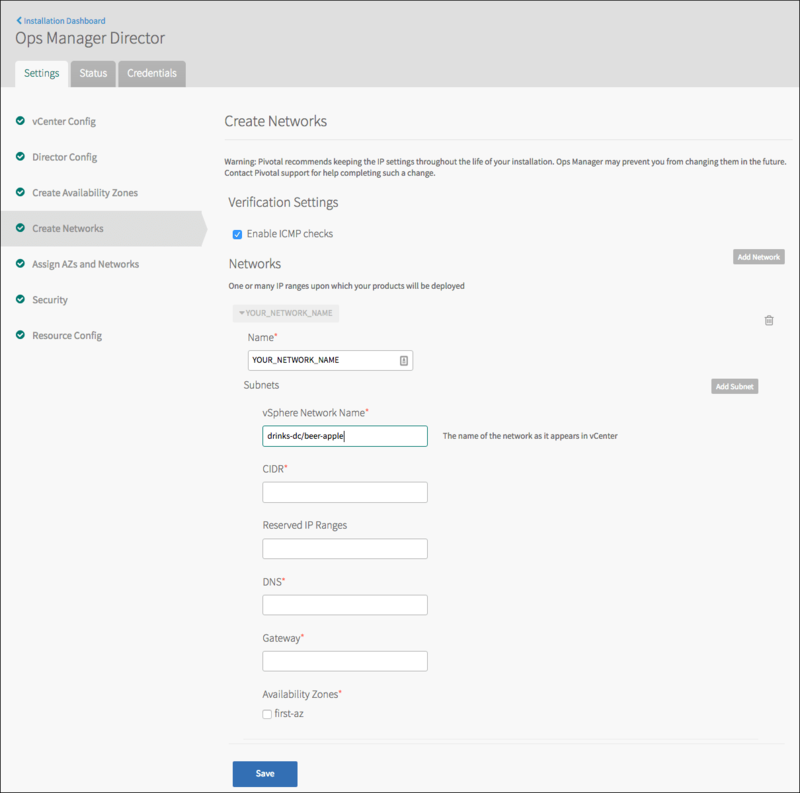 In the vSphere Network Name field, instead of entering your network name, enter the folder name and port group name for the switch, as you configured them in vCenter. For the example vSphere environment pictured above, you would enter drinks-dc/beer-apple to use the switch configured on the beer-apple port group. Return to Configuring BOSH Director on vSphere to complete the Ops Manager installation.